The forest products industry contributes to each parish economy in several ways, including jobs, wages and purchases in the local economies as well as local, state and federal taxes. Additionally, the purchase of goods and services by the forest products industry and its employees spurs economic activity in other sectors of the economy, resulting in a substantial cumulative economic contribution. 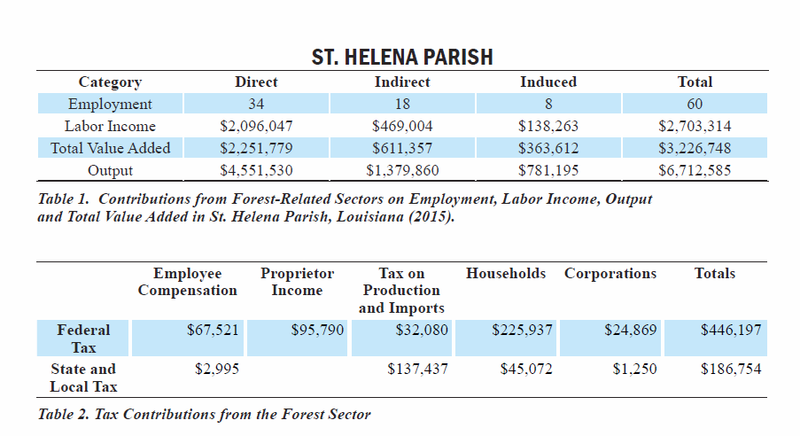 The forestry and forest products industry in St. Helena Parish, Louisiana, had a total economic contribution amounting to approximately 60 jobs and $2,703,314 in income during 2015. Forestry and the forest products industry generated an output of $6,712,585 in this parish. Total industry output is defined as the value of all goods and services produced in the parish. Value added amounted to approximately $3,226,748. Value added represents the creation of new wealth and is inserted into the economy through payments made to workers, interest, profits and indirect business taxes. These results were obtained using Impact Analysis for Planning (IMPLAN), an input-output model. Input output analysis can track how the inputs of one sector of the economy are the outputs of other sectors. This can illustrate a sector or group of sectors’ importance to the overall economy. Employment: Number of full- and part-time employees in the chosen industries and the jobs created in the rest of the economy by the chosen industries. Labor Income: Includes wages, salaries and benefits of employees as well as income for self-employed individuals. Output: Represents the value of industry production. Value Added: The difference between an industry’s total output and the cost of its intermediate inputs. Direct Effects: Refers to the sector’s own production, value-added, employment and labor incomes. Indirect Effects: Refers to the economic activities in other sectors by the forest sector’s purchase of goods and services from those other sectors. Induced Effects: Refers to spending by employees from the forest sector on goods and services, such as groceries and gasoline. Contact: Shaun Tanger at stanger@lsu.edu for more details on this publication.